The man on the park bench stared at the empty space above the knuckle of Nora Pennington’s pinkie finger. Strangers were always hypnotized by this gap. They would gaze at the puckered skin stretched over the nub of finger bone for several awkward seconds before averting their eyes in disgust, pity, or both. What a treat to get to interview Ellery Adams! And (perk of the podcast!) get to read her new book, The Secret, Book & Scone Society, the first in a new series. 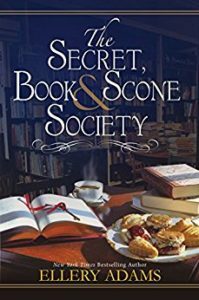 A blend of mystery and women’s fiction, The Secret, Book & Scone Society has at its core the developing friendship between four women — none of whom makes friends lightly. Brought together by an unexpected death and realizing that, without them, it will go unpunished, they bond over books, scones — and their darkest secrets. Ellery is a writer who loves books. That is evident in her Book Retreat Mysteries (new one, Murder in the Locked Library, coming out in the spring!) 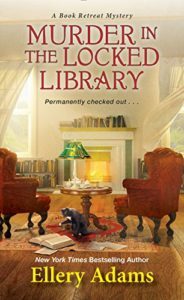 and also in her new series: “bibliotherapy” is a central concept in The Secret, Book & Scone Society. What is that, you ask? Nora, Ellery’s protagonist, helps people overcome problems by giving them a list of books to read. And Kensington, Ellery’s publisher, has set up a site where Nora can do that for you. Go ahead, check it out here. But come back, because then you should check out Ellery’s Facebook page, where she’s running giveaways galore throughout November. Laura Brennan: My guest today is the prolific and beloved author, Ellery Adams. Ellery lays claim to a lifelong love affair with stories, food, rescue animals and large bodies of water — all of which make their way into her mysteries. A New York Times bestselling author, she has written more than 30 novels and has just launched a new series with The Secret, Book & Scone Society. Ellery, thank you for joining me. Ellery Adams: Thank you so much for having me. LB: You are such a beloved author in the mystery world, how did you first get started writing? EA: Oh, boy! I have been writing since I was a kid, and I was always charging for my work, right from the get-go. I don’t know if it was because I was one of three kids, or the middle child seeking attention, but I used to write little stories about my friends. And they would always be the hero, and they would always get a happy ending, and I would do some illustrations and I’d sell it to them for a quarter. LB: And then you started doing it professionally, and you started right away in mysteries. EA: I did, but I had lots of other jobs in between. Some really difficult jobs like working in a dry cleaners and doing catering work, and then I became a sixth grade language arts teacher for a while. So I didn’t go right from childhood into the writing. I had to have some real life experiences first. And it was only when we moved from North Carolina to Virginia and I really didn’t know anyone, and I was really homesick for North Carolina. I was working at Barnes & Noble, the bookseller, and one of the great things about working there is you can just constantly read and be exposed to new titles. And I think I had read about three mysteries in a row where I just found them lackluster. They weren’t bad or anything, just I didn’t feel anything when I finish them. And I thought, I really would like to give this a try while I’m working here. And that’s how the first novel started. I had the time and I was super homesick. LB: Now, was that in the Supper Club series or the Molly Appleby Collectible series? EA: It was the Molly Appleby. Molly was loosely based on me. I had always collected North Carolina folk pottery, and I had it surrounding me in my new house and it was kind of the only thing that was really giving me comfort. Anyone who wants to write, the first book is the hardest. If you can actually get that out and get it completed and start editing it, you can be an author. It’s that first book is so difficult. And I really, I got to about the halfway point and thought, I can’t finish this. I don’t know what to do. And then I literally dreamed the next sequence and that got me through. So it was like, thanks universe! LB: Oh my gosh, that’s so wonderful! I just interviewed Jeri Westerson, and she dreamed the plot of her new series. LB: Now, you also collaborated with other writers: Elizabeth Lockard on the later of the Hope Street books, and Parker Riggs, and Sylvia May on the first three Novel Idea mysteries. EA: Yes, and actually I’ll be collaborating with the wonderfully talented Rosemary Stevens, who is going to continue the Supper Club Mysteries. Which is such good news because I don’t have time to write them and I really miss those characters, and readers miss those characters. That whole experience has just been — the collaboration experience — has been wonderful. When Sylvia and I wrote the Lucy Arlington series, it was really challenging because she lives in Bermuda. She used to live down the road from me when we came up with the idea, and then she moved to Bermuda. So it was really tough to send these chapters back and forth. We had a great time writing the three, and then when they asked us to renew the contract, we both said, it’s just too hard. I mean, if we lived down the street like we used to, no problem. We’d pour coffee and get going. But when you’re that far away, it’s really challenging. LB: So is your process different with different writers? EA: No, you know, it’s pretty much, with the other series, those books kind of come off a bible. It’s almost like a writer for hire situation. So if I were to get a writer-for-hire contract through a major publishing house, they would already have the bible ready. Which is pretty much an outline of the plot and the current characters, and they would hand it to me and say, okay, this is what we want the book to be about. Now you take your certain flair and run with it. And that’s pretty much where we are with those series that are no longer being traditionally published and are being published through Beyond the Page with co-authors, is that were going from a bible and then I’m just trusting those writers and their talents to take it and run. All three of them are amazing. LB: I actually am delighted to hear that the Supper Club series is going to be continued because that’s a favorite. EA: Thank you. I will say, too, that I went on every single diet in those books, and I’ll probably have to go on the diet that Rosemary Stevens is writing about because I sit a lot when I’m writing and things find their way into my stomach. LB: So how do you develop your series ideas? EA: You know, there’s no rhyme or reason to it. As a matter fact, it at times can be really annoying. I am supposed to be working on — well, I am working on the second novel in The Secret, Book & Scone Society series. And just out of the blue, I got an idea for a coming of age suspense novel. I started writing down ideas for the characters and some of the scenes, and it’s really — this is not good timing. I have a new book to promote, I have a current book to write. Those guys are going to have to wait. But I keep thinking about them, and even when I’m working on this current book, I’ll get an idea for that book and I’ll put it in a notebook. Honestly, I just don’t have enough time to write all the books that I would like to write. I would like to write young adult, I like to write mystery, I just — there are only so many hours in the day, and I still have two kids at home. So I keep saying to myself, once the kids are off, I will try writing other genres. But right now, I still have to do laundry and pack lunches and all that glamorous stuff. LB: But they all come out in your novels. Is that deliberate, when you’re developing, or you do you just look for places to drop them in? EA: Well, I try to have every series be really unique. I think one of the things that’s really important to me is setting. Setting is almost another character in the book. If you’ve done a good job creating a realistic, tactile, complex setting, then people really gravitate to that I’ve noticed. So Books by the Bay, that’s my water setting. I do love the beach and I do love water, but I kind of save those feelings for that series. I don’t bring too much about water, or large bodies of water, into other books, even though I have these thermal pools and hot springs in the new series. It’s not, the character doesn’t have the same connection to water as Olivia Limoges had to water. So each character has a connection to her setting for a different reason, and they’re all settings that I love. I mean, in the Book Retreat Mysteries, you’ve got a hotel where every room is named after an author or types of books, and they are all filled with books. To me, that’s just like fantasyland. I don’t know that place, but I wish that place existed, so I created it. LB: Well, speaking of Books by the Bay and Olivia’s series, you just wrapped that up. LB: Is it as bittersweet for you as it is for the rest of us? EA: It was really difficult. I hadn’t expected to be ending the series at that point and that current publisher had decided to pretty much scrap all of its mass-market books. And even though I saw it coming and was able to jump ship over to Kensington, thank goodness, it was still really hard. I loved my editor at Berkeley, she was really good for me and really helped me grow as a writer. And I wasn’t ready to wrap it up yet. But I also knew that the likelihood of me being able to sell that to another publisher after eight books in was slim. So I thought instead of kind of peddling it and having it released in small print or something that it’s going to kind of go downhill, I’d rather just say goodbye. LB: Well, thank you. It’s so hard when authors don’t finish the story; at least you did have the opportunity to do that. EA: That’s true. It’s okay to have cliffhangers on a Netflix show, but not in a series where you’ve really invested. You know, I had readers who were really angry. They didn’t like the ending, they didn’t like that it was ending, and I totally understand how they feel. I think it’s really hard for some readers to not have perfect happy endings with traditional mysteries. But I think that as I’ve been progressing and growing as a writer, it’s been really important to me to have stories that, even though you’re not going to have that many murders in a small town and that seems unrealistic, I want to create more and more realistic characters. And I thought, you know, Olivia was never really meant have the husband and kids life. That just wasn’t her. She is as shifting as an ocean, and to me it seemed like the perfect circle for her to go back where she started and still be okay. Like, a message to women everywhere that you can be okay by yourself if you have other relationships that are meaningful. Even if you lose that romantic relationship that’s important to you. So, I don’t know. I guess I was trying to send somewhat of a message about the positivity of women’s independence, but I think it got lost in the fact that it was the end of that series. LB: It’s hard to say goodbye, too. I think that that’s definitely a factor. EA: Yes! It’s just hard to say goodbye. LB: Well, that brings us very nicely to your new series, The Secret, Book & Scone Society. It will just have launched when this interview goes live, so for someone who hasn’t picked it up yet, what do we need to know about it? EA: Okay, well, I consider The Secret, Book & Scone Society almost a new genre. I like to think of it as suspenseful women’s fiction. So it’s a combination of women’s fiction and mystery. The novel focuses on bookstore owner Nora Pennington, and she’s a woman who keeps to herself unless she’s helping her customers. And part of that help might include a special session of bibliotherapy, which is when Nora will recommend a group of books to help a person heal from some sort of hurt. That hurt can be physical, it can be emotional or it can be both. And she tries to assist a visiting businessman by offering him one of these bibliotherapy sessions. And he never actually makes it to Miracle Books because on his way over there, he is mysteriously killed. And she feels a connection to him, as someone she was unable to help in life and so she tries to help him — she tries to seek justice for him, because she doesn’t think it’s an accidental death. And along the way, she forms a tenuous friendship with three other women who, like herself, are damaged or scarred in some way and have secrets from their past that they don’t want to share with anyone. And slowly, as the book progressed, they share their secrets with each other and also seek justice for this visiting stranger. And in the end, they are the ones who find healing. LB: I cannot tell you how much I enjoyed this book. EA: Oh, thank you! It is my favorite book so far. LB: Well, that shows you have very good taste. First of all, I cannot get over how much I love the idea of bibliotherapy. That the right book, at the right moment, can change a life. I just love that. Has that ever happened to you? EA: I think that it’s happened to me in several stages in my life. And I think that for all of us who are booklovers and bibliophiles and readers, we can think back to some point in our childhood or early teen years where we read that book that made us readers. Readers aren’t necessarily born, we’re kind of forged. And for me my early childhood period, it was The Trumpet of the Swan by EB White. And then I was having difficult kind of eighth and ninth grade years, and it was A Wrinkle in Time. And you know, I can kind of go through every decade and pick out the book that kind of brought me back down to earth or lifted me out of a pit or… You know, people have always helped, but books have had a really special place in my life for getting me through tough times. I don’t think that their power can be underestimated. LB: One of the themes that is through a lot of your work is the idea that everyday objects can be imbued almost, certainly with power and almost with magic if they are created or chosen with care. LB: You know, I’m thinking about the scones and the books and the pies, right? EA: That’s true, and I think that one of the reasons I have been gravitating towards magical realism in some ways in my writing has to do with these kind of objects. I think that we can all collect objects that are given to us by people we love, or made with love. And I think whether it’s a piece of pottery or it’s a — I have a wonderful wooden pen that a reader made for me and I can feel what he put into that pen. Not just the effort and the work but the fellowship and the gift that he was sending me is in that pen. It just doesn’t feel like a Bic ballpoint. I think that every artist puts a little bit of themselves into the things that they make. And I think I’ve just gotten more in tune with that as I get older. It’s what I try to do with my writing. Literally, I am so exhausted when I finish a book because I think I do put little pieces of my soul into each one. I don’t know what’s going to be left when I’m old, but it’ll be totally worth it. LB: I love that you called The Secret, Book & Scone Society a new genre. Well it has a lot of the trappings of a cozy, it’s not a cozy. It’s deeper. I thought it was a great book for book groups. EA: Thank you. Yes, I wanted it to be something else. I guess I’ve been sticking my elbows against the bubble of, okay, here’s what you write, and here’s what the rules are for what you write. I think I’ve been pushing the boundaries with Books by the Bay for quite a while, and it’s one of the reasons I loved my editor. She let me do that. She really trusted me and I’m super grateful for that because a lot of people would contact me and say, well, your cozies are edgier than usual, and your characters are more complex. But, you know, you shouldn’t do this and this in a cozy. And I thought, all these rules! And I totally understand why they are there, that readers understand what they’re getting when they buy a book. But then there are the women’s fiction books and their rules. And I thought, why can’t we blend some of these things, why can’t we blur some of these lines if what we’re going to come up with is a little bit of what everybody loves. Some books and some friendships and some justice seeking and a positive ending without, you know — I don’t have a pet in here on purpose. EA: Because I really didn’t want an animal on the cover. And I love animals! LB: Captain Haviland is a fan favorite. EA: Yes! And, you know, Muffet Cat from the Book Retreat series, everybody loves him. He’s a fat, grumpy tuxedo cat and people can identify that. And I remember saying to my new editor right off the bat, I don’t want any animals on the cover of this. I don’t want it to look like any other book. I want to try to break a mold with this one. And I don’t know if it’s going to work, but I had to do it. LB: One of the things that I really enjoyed was the center, the heart of the story is the relationship between these four women. And it’s not that old, easy friendship that someone falls back into when they go home. These are newly forged bonds and the women don’t trust each other very much to begin with. EA: Right! They really don’t trust anyone. I think that there is an element that we all share in, when we approach a new friendship, it’s kind of, how vulnerable do we make ourselves? And in their cases, they’re not good with vulnerability. They’ve been trying to hide from these secrets for really long time. And I think you can get rusty at human connection and rusty at making friendships. And I think that the older you get, it can be really challenging to make new friendships. Friendships are almost like dating. People, they want to get to know you, they want to figure you out, and if you’re not ready for that it’s super scary. I think Nora was not ready at the point where this book started, but then she realized that she was not going to be able to succeed with any of her goals by herself. I mean, as humans, we’re social creatures and we just aren’t good at being alone. It’s not good for us. LB: I love this new adventure and I’m so excited for it. What else are you up to? What’s next for you? EA: Well, I have the next Book Retreat Mystery, is coming out April 24th. That’s Murder in the Locked Library. And this is a really unusual installment here because it’s basically opening the door for all kinds of crazy things to happen in the series. I had a really good time writing it. That’s like my vacation series, when I get to one of those books I’m like, yes! It’s time for Book Retreat, this is going to be so much fun. I’m hoping that reader sense how much fun I have when I write those. I really just wish someone would build Storyton Hall and we could all have giant book conventions there, but maybe some multimillionaire will read my book and build it! But that’s coming up in April, and then I am winding up the sequel to The Secret, Book & Scone Society, which is currently called The Whispered Word. I’m not sure if that will be the final title, but that’s the working title. And the stranger introduced at the end of Secret, Book & Scone Society will really make an impact on Miracle Springs. LB: So, bibliotherapy, that’s one of the things I wish existed in real life. EA: Well, and in a sense, it’s now available. Kensington, they are my publishers, have set up a website called YourBookRX.com — so RX as in prescription. YourBookRX.com. And every week I’m going to pop on there and read people’s emails or messages and will select a few and provide that person with a list of recommended titles. And I guarantee the problems that one person shares will be shared by 20 other people and those book lists will help them. So if you want to give that a try, just stop by the website and fill out the form and if you get picked then there will be a list of individualized titles just for you from Nora, the bibliotherapist. LB: And where can people find you online? EA: Oh, I’m everywhere! I’m like a plague rat. So, I’m on Twitter, I’m on Instagram, I’m on Facebook. My website is ElleryAdamsMysteries.com, and I think that if you just Google Ellery Adams, it’ll come up too. On Facebook, I’m actually doing all through the month of November, from November 7 to November 30, an online book club on my Ellery Adams Author Page, and it is going to be so much fun. We’re going to discuss the book, I have a whole bunch of mystery guest authors coming like Miranda James and Lorraine Bartlett, Leann Sweeney, Mary Kennedy, Peg Cochran. So I’ve got lots of friends dropping in and there’s going to be tons of giveaways. I have been shopping all month for this thing, so — we’re really going to have fun. LB: That’s fantastic! Well, I will of course link to that in the show notes but I will also put it on my Facebook page so that people can get it. EA: Yeah, and they can join the book club anytime. They don’t have to be there from the beginning because we’re going to have a no spoilers rule. Nothing from the book will get leaked, unless they show up November 30. Then they are probably going to hear some stuff. LB: Well, this has been just wonderful. Ellery, thank you so much for joining me. EA: Thank you so much for having me. It was my pleasure.